I had heard of aluminum fenders , but the new Mercedes have aluminum doors. They are much harder to repair and in most cases replacement is necessary. In the case of our long time customer we were able to repair the door and fender saving considerable expense. Road hazards that you often cannot avoid. Cold and modern plastics don’t mix well. As seen on CBC, just a reminder to watch out for snow banks, ice banks and other winter dangers. Always leave extra braking distance as you never know where black ice is lurking. We will give a 15 % discount on any owner pay ASSURED body shop written estimate. We have many aftermarket and used car suppliers that assured body shops do not use with much better discounts for parts and supplies. You can even email a photo of the damage and we will give you a quote online. We are located downtown 2 blocks west of BANK St and have ample parking. Don’t jump that snow/ice bank. Now that temperatures have gotten below -15 Celsius its time to shovel the snow bank. 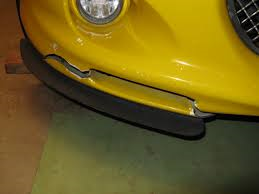 Most modern vehicles have plastic bumpers. 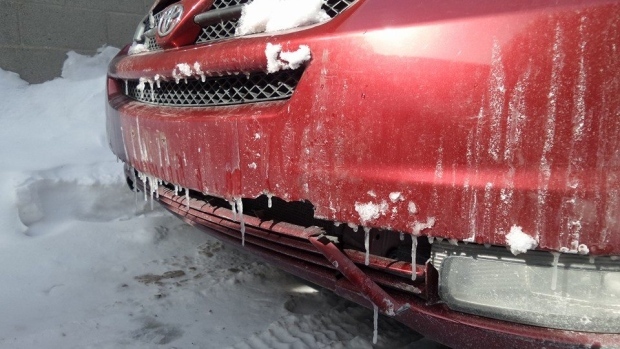 The colder the temperature gets below zero the more chance that hitting a snow bank will crack the bumper. This is true of both original equipment bumpers or aftermarket bumpers. Often times the bumpers can be repaired with 2 part epoxy glues. I wanted to thank Randy at Advance Towing and Recovery for all the hard work they have done this year. We have donated many cars to CHEO CARS 4 KIDS and they have always been punctual and honest with us.